A RACIST mum who forced police to seize her distressed son as she clung on to the child screaming 'they're going to take mummy away' has been spared jail. Portsmouth Magistrates' Court heard how officers went to Samarah Rivers' former partner's home to a domestic incident to find her drunk in the kitchen clutching her young son so tightly the boy wept. Police went to arrest her and she said: 'They're going to take mummy away, do you want to live with daddy? Cops finally prised the six-year-old from her arms and took the boy to the safety of the living room. When Rivers, 42, was put in the back of a police van she unleashed a torrent of racist abuse. Directing her racist abuse at another officer she said he had a 'big nose, Jewish’. The court heard Rivers, of St Paul's Road, Southsea, has a previous conviction of anti-Semitic abuse in messages sent to a Dorset woman via Facebook. Judge Arnold said courts would not tolerate 'the most vile anti-Semitic' abuse and any form of racism would 'not be tolerated by courts, particularly in the present climate'. Handing down a 16-week prison term suspended for a year, the judge said it 'weighs heavily' on her that sending Rivers to jail would punish the defendant's child and mother. Rivers must complete 15 days of rehabilitation activity requirements with and £85 prosecution costs and £115 victim surcharge. Lian Webster-Martin, for Rivers, said her client claims not to hold racist views when sober. Rivers admitted two charges of racially-aggravated offences of using threatening, absuive or insulting words or behaviour causing harassment alarm or distress. 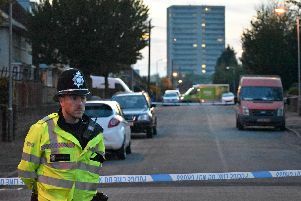 You can catch up with more of our stories about crime and incidents in Portsmouth by joining our Portsmouth Crime and Incidents Facebook group.